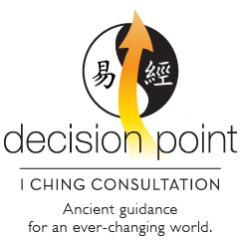 How Can the I Ching Help You Make the Right Decisions in the New Year? Happy New Year everyone! Regardless of your political bent, you are probably expecting that the new Trump administration will shake at least a few things up in the U.S. and world in 2017 and beyond — changes you may dread or eagerly anticipate, or any of the complicated emotions in between. For the New Year, I thought of asking the I Ching for an overarching “lay of the land” prognostication of what’s in store, but then thought better of it. As I discuss on my Using the I Ching page, such “weather reading” questions can be very difficult to interpret because they are not grounded in a topic. When you receive a reading such as: “Establishing the New, Supreme good fortune. Prosperous and smooth,” * what does it refer to? Relations with Russia? The repeal and replacement of Obamacare? End of the Syrian conflict? Instead, I thought it time to leave politics aside and blog about something useful for a change. In other words, for the New Year, I want to demonstrate how the I Ching really can be a valuable guide for making personal decisions by discussing a recent example from my own life. Last summer I was laid off my job. Since that time, I, an introvert by nature, have had to crawl way outside my comfort zone to apply for jobs, go on interviews, reach out to people I hardly know for advice and ideas, attend workshops, join new organizations, and confront roomfuls of strangers. Losing my job was also the impetus for going more public with my 35-year I Ching practice and, hence, founding Decision Point. So the decision that confronted me one recent day was whether or not to go to a local networking event. As this one was hosted by a local Chamber of Commerce with the focus on business ownership, I would need to present myself not so much as a person seeking her next opportunity in research project management, but rather as the owner of Decision Point. I was terrified at the prospect, and not only because I’m an introvert. I felt this Chamber event was probably the wrong venue for my I Ching consultation business because other attendees would probably be “straight” business people who wouldn’t be receptive to an oracular system such as the I Ching, even though it has been venerated in China as a philosophical system for, literally, millennia. If this were California, I might find a receptive audience, but certainly not in the outer suburbs of Boston. Attending the networking event this evening? Even though I do tell my clients that the I Ching is very capable of not supporting their ego’s position on a decision or stance, over the years the oracle has generally supported me in my desire to stay home from events, especially if I’m not going to know anyone there. For going, I received the hexagram indicating standstill (or stagnation) changing to the hexagram for progress. And, what’s more, this “progress” was probably the best I could have received for this question, because it refers to progress specifically relating to being promoted in a professional or political — as opposed to romantic, family, or spiritual — setting. Moreover, the reading changed into this progress from a stagnant state of affairs, which certainly described my “progress” thus far in promoting Decision Point. By contrast, for staying home I received the hexagram for shock, changing to that for avoidable conflict. If I stayed home the I Ching was telling me I could unnecessarily be exposing myself to some danger and contention. This interpretation — unlike many — was a no-brainer. So, still uncertain, I went. At first, it was what I expected: a bunch of people in business attire talking among themselves. It didn’t seem like meeting anyone would be easy. So I sat myself down at the bar, alone, and began eating some pizza, while two men carried on an animated conversation next to me. But, after a bit, one of them left, and the other turned to me. We started talking, and he critiqued my business card. Then his wife came over and she, as it turned out, regularly attends a local holistic center where I’d been meaning to introduce myself. She sees a psychic there, and knows the owner well. So that conversation was off and running. Then she flagged down another woman, who owns a day spa. After discussing the I Ching with her a bit, I could tell she was very receptive to the idea of introducing it to her clients. I took her card, and subsequently followed up with her, which resulted in a meeting where I provided her a demonstration of how the I Ching works. She was impressed, and I will probably participate in some sort of spa day for women in the New Year! Without the I Ching’s push, I probably would never have attended this event—but I came out of it with four connections, a presentation opportunity, and possibly at least one job! Because it reads the “seeds” of upcoming events, the I Ching can guide us in making the “right” decision, i.e., the one that will yield the most beneficial (or ethical) result among the options available. The I Ching can help you make the right decisions in the New Year as well! Contact me today to set up a phone or Skype meeting. To make these blogs more immediately digestible, I provide the commentary first, followed by the actual readings, so that readers acquainted with the I Ching can check my interpretation. Wisdom of attending the networking event: Hexagram 12 (title: “Standstill” **) changing to Hexagram 35 (“Progress”). There was 1 change line, in the fifth position. Wisdom of not attending the networking event: Hex 51 (“The Arousing [Shock, Thunder]”) changing to Hex 6 (“Conflict”). There were 4 change lines, in the first, second, fifth, and sixth positions. *Words and passages quoted in this blog are from Huang, A. (1998). The Complete I Ching: The Definitive Translation by the Taoist Master Alfred Huang. Rochester, VT: Inner Traditions. ** Titles vary by translation. For this blog, I used those developed by Richard Wilhelm and Cary F. Baynes in one of the first authoritative I Ching translations to appear in English, The I Ching, or Book of Changes, (1950/1967). (R. Wilhelm & C.F. Baynes, trans.). Princeton, NJ: Princeton University Press. Previous Previous post: My Readings of Election Results Were Inaccurate: Why?